About ten years ago, I found myself among a small group of audiophiles who were bent on doing equipment comparisons ad infinitum...or at least so the eternity bit seemed. Most of us were members of the Connecticut Audio Society, CAS. However, since we lived in closer proximity than other members, we got together informally between meetings to perform these equipment shoot outs. Talk began to circulate among CAS members about our renegade group. Soon, they took to calling us the Southern Connecticut Audio Group or SCAG for short. This moniker stuck and in one of the CAS newsletters, hillbilly caricatures of each of us were created. There was Cousin SCAG known for boisterous and rude outbursts; Grandpa SCAG the calm one, given to taking stock at the end of the listening session; and so on. Adolescent as this may have been, it was all good clean fun and much was learned. 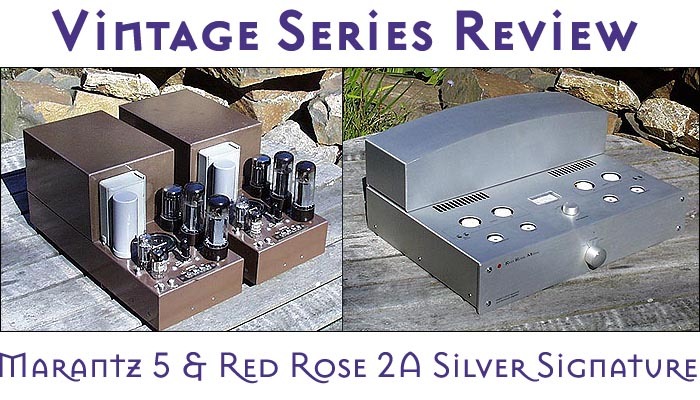 In the spirit of SCAG, I now set out to briefly compare two EL34 tube amplifier designs for 6moons, each of which could be considered among the best of its time: The vintage Marantz 5 monoblocks and the modern Red Rose Music 2A Silver Signature. I believe it was Saul Marantz himself who designed these Marantz 5 amps while Richard Sequerra joined later to work on the 8B and other products. For the Red Rose amplifier, Mark Levinson employed the design skills of Victor Tiscareno, formerly the designer/owner of AudioPrism, a company Mark Levinson eventually acquired under the RRM umbrella. An important consideration before evaluating the performance of vintage equipment is to make sure that it's operating properly and not disadvantaged by worn-out/out-of-spec parts that have degraded over the years. I did replace the large electrolytic filter can in the power supply -- one per amp -- with new production units from Valve Amplification Company who fabricated the Marantz reissues. The original filter capacitors weren't faulty, mind you - I just wanted to install a fresh set, which did clean up the sound noticeably. My Marantz 5 amps were also recently bench-tested by a professional tube equipment shop here in Connecticut and found to be operating at better than original specs. While both amplifiers produce about 35-40wpc in pentode mode, there are a number of apparent differences between these designs. I cannot comment on the respective quality of the output transformers since I am unaware of the source for either. 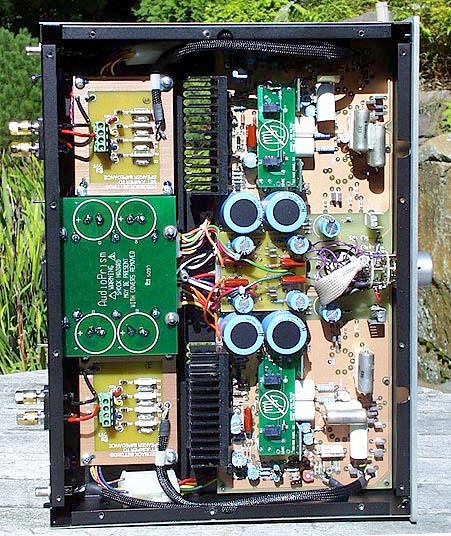 In the power supply, the Marantz amplifiers use a 5AR4 tube rectifier and a combination of choke/oil-capacitor/ multi-section electrolytic filtering while the Red Rose stereo amp uses solid-state diode rectification and relies on the common modern approach of large-capacity electrolytic filtering (with a capacitance an order of magnitude greater than the Marantz amps). The Red Rose adds independent power supplies for each channel and tight voltage regulation on both the output and driver tube stages. Certain people downplay this Red Rose amplifier by claiming that it's just a repackaged AudioPrism Debut. However, in an e-mail Victor Tiscareno pointed out that although the basic design for the Red Rose Model 2 "began life as the AudioPrism Debut amplifier in 1992, the circuitry was significantly upgraded especially in the power supply department. Also, the Silver Signature uses a completely different set of custom-designed audio output and power transformers with very high-grade steel." Parts quality in general differs as well between the Marantz and RRM units. The 5s use Good-All coupling caps along with carbon-comp resistors. The Red Rose Silver Signature employs MIT Multi-Caps bypassed by vintage Sprague Vitamin Qs as well as Caddock and Tantalum resistors in liberal quantities. While modern resistors may offer better-measured performance and stability, vintage heads are loathe to rely on anything other than carbon-composition resistors for their restoration and even DIY projects. The front-end circuitry of the amplifiers differs as well. The Marantz amps use a 6BH6 pentode for the voltage gain input tube and a 6CG7 as the phase splitter. The Red Rose amp uses four 12AT7s serving either function. Both amps have a convenient top-mounted meter and adjustment pots for setting the output tube bias. Bias drift in either design was almost non-existent. Lastly, the Red Rose Model 2A Silver Signature gets its name from the custom-designed solid silver Litz wire used for all connections inside the amp. Contrary to reviewers in other magazines, I do not confine myself to the tube selection provided by the manufacturer and used the best valves I had available for each amp. That meant Mullard EL34s of the most desirable version (xf1, large base) for both designs. In the Marantz, I then added an Amperex PQ mesh-plate E90F (the premium European equivalent of the 6BH6) and an RCA clear-top 6FQ7/6CG7. In the Silver Signature, I used RCA black-plate 12AT7WAs for the input/driver stages. All of these selections are the result of a long comparative process within my fairly extensive tube collection. Given that my Audio Physic Anniversary Step speakers have a sensitivity of only 84dB sensitivity coupled to a 4-ohm impedance, the 35wpc pentode power of these amps appeared to be the bare minimum. On the other hand, Audio Physic's specifications include a recommended power rating of 10 - 60 watts and I know people who use 16wpc SETs on them. Further adding to the equation is the additional load represented by my powered Audio Physic Luna subwoofer, which I run high-level off the amp's speaker terminals rather than low-level from the preamp. This is both the recommended setup in the Luna operator's manual and what I prefer. As an aside, the Audio Physic Anniversary Step is quite a special design with no crossover on the bass/midrange driver, which is instead direct-coupled to the amplifier. This produces much of the purist qualities sought after by the single-driver enthusiasts but then adds a tweeter for treble extension. Despite their inefficiency, these speakers are very revealing and make good evaluation tools. Both amps were connected to the Steps and Luna subwoofer from their 4-ohm taps. It quickly became apparent that the Marantz amps were having trouble driving this combo by sounding anemic and bass-shy. While there are internal feedback adjustments that can be made on the Marantz amps, I decided not to get that deeply involved. On the other hand, the Red Rose amp drove my speaker trio handily. On the Silver Signature, one has to open many screws on the bottom cover of the amp and switch for the desired impedance tap of 2, 4, 6 or 8 ohms. While this can be annoying if one had to do so repeatedly, it is a purist approach that has merit. In addition to switching the impedance, one also needs to move a corresponding jumper that sets the feedback level to what the designer considered optimal for that impedance. This is an excellent design feature that gives the Red Rose design a leg up for driving a wide variety of speakers. Playing a Jazztone LP, The Bob Brookmeyer/Zoot Sims Quartet [J-1239], the Red Rose amp produced a truly full-range performance with solid bass and good rhythmic drive. It did a great job showing off the wonderful interplay of alternating trombone and saxophone solos, with rich yet not excessive tonality. Next on the platter was the Oscar Peterson Trio with Roy Eldridge, Sonny Stitt & Jo Jones, At Newport [Verve UMV 2618] that portrayed the same fullness of tone. good weight and impact. Next to spin was Diane Schuur's In Tribute [GRP-2006]. This is a musically great CD with excellent arrangements of classic jazz, but is somewhat hot or forward sounding. I use this CD to see how equipment handles such recordings of which everyone has a number in their collection. Diane's powerful vocal came through with only a hint of forwardness. Not surprisingly, the piano accompaniment behind Diane seemed more muted via the Altecs than the earlier Steps. Still, the salient characteristics of the Red Rose amp came through: Good dynamics, rich tonality, strong bass performance and a tight grip on the music at all times. Playing these same selections with the Marantz 5 amps, I could begin to take better measure of them. My initial impression was of a less robust and more cerebral presentation. The Red Rose has a visceral quality that the Marantz couldn't muster. However, the vintage amps gave the impression of very low distortion and great delicacy. Bass from them was a classic illustration of what tube rectifier devotees purport. Bass from tube-rectified amps is often not as powerful as via solid-state rectified tube amps yet it can have a more natural quality with better note decay. I remember how this was first being discussed with the GSI mods of the Dynaco Stereo 70s in the late 1980s. Andy Fuchs, the man behind GSI, would replace the Stereo 70's tube rectifier with a silicon diode. People reported the bass to be punchier and tighter but not everyone preferred it. 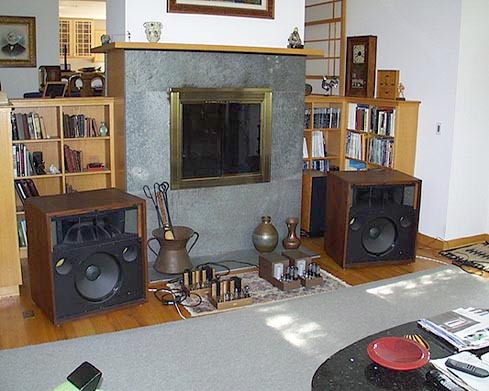 The noise floor on both the Marantz and Red Rose amps was very low even while listening through the Altec horn speakers. You could hear a bit of noise when you put your head next to the Altec mid-horn but both were equally quiet. This is quite a testament to the design prowess of Marantz for that period. relaxed fashion and the soundstage extended further to the sides of the speakers. Moving to other tracks on this CD confirmed these impressions. Going back to the Red Rose, the character of the amp remained as it was with the subwoofer connected. The amp can obviously handle more difficult speaker loads to produce a solid musical foundation with excellent control and pace. On transparency and detail, both amps were excellent, with the Red Rose slightly better at reproducing soundstage depth and casting images that had a bit more solidity while being more clearly delineated in space. These differences were small, though, and of little importance for my taste. In summary, I really found this comparison to be a classic trade off. If you need an amp that can drive a wide variety of speakers but still gives you great tube sound, the Red Rose is an excellent choice. If your speakers are less demanding, the superb midrange and more relaxed quality of the Marantz amps may serve you better. The ideal amp would be a marriage of the two. In the end, revisiting one of the classic EL34 amps of all time proved that not everything old in audio is dated. While condition becomes of overriding concern with vintage gear, you might be surprised by howl little relative advances might present themselves in even-handed comparisons with contemporary designs. I believe this is less of a negative reflection on the newer designs as it is a reminder that certain circuit topologies were implemented to perfection in designs of yore. Even far more modern parts can't much improve upon those if we take into consideration the changes in speaker loads that the passage of time has bestowed upon us.